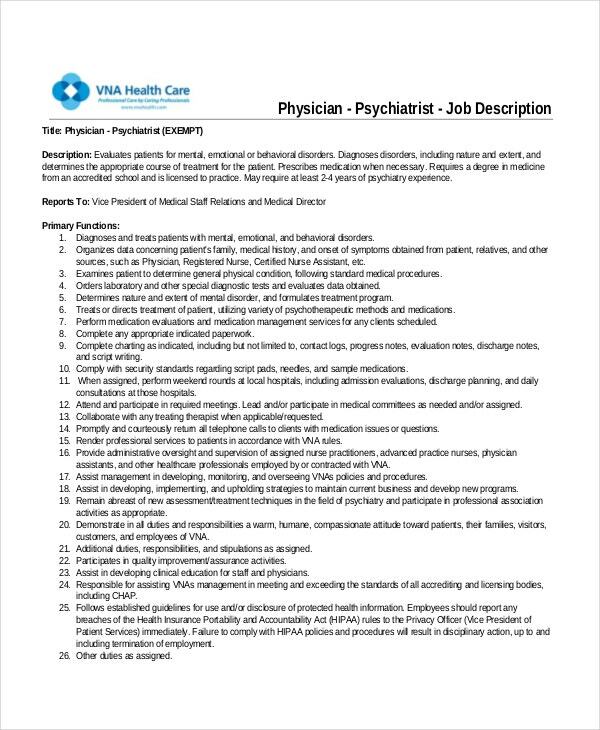 A physician job description is a must when you are about to advertise the vacant job position for a physician in your hospital or clinic. As the name says, such a description offers a detailed list of the essential duties and responsibilities to be maintained by the candidate when hired- as well as what qualifications, skills, certifications, and training are expected from him/her to apply for the post. Some of the job descriptions also outline the working hours and the salary. You have a practical physician job description here that includes all the sections standard for such a description like a summary, essential duties and responsibilities, qualifications, and physical requirements. It also enables the candidate to state his need for accommodation. You can also see Nutritionist Job Description Templates. You have a smart medical assistant job description here that has listed down the essential duties to be performed in a legible table format – it also enables you to list educational qualifications required, working conditions, etc. 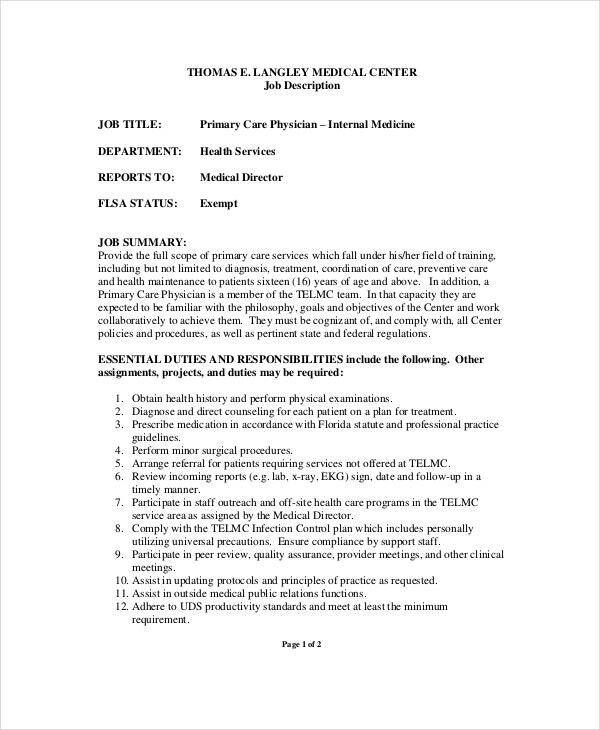 You are getting a detailed primary care physician job description here that starts with a solid job summary, followed by essential duties, supervisory responsibilities, qualifications, physical requirements, and so on. > What are the tips for Creating a Physician Job Description? First of all, you should know that physicians are busy professionals and hence you have to ensure an easily legible physician job description. Thus, experts always advise to list down the essential duties and responsibilities as well as qualifications in convenient bullet points. 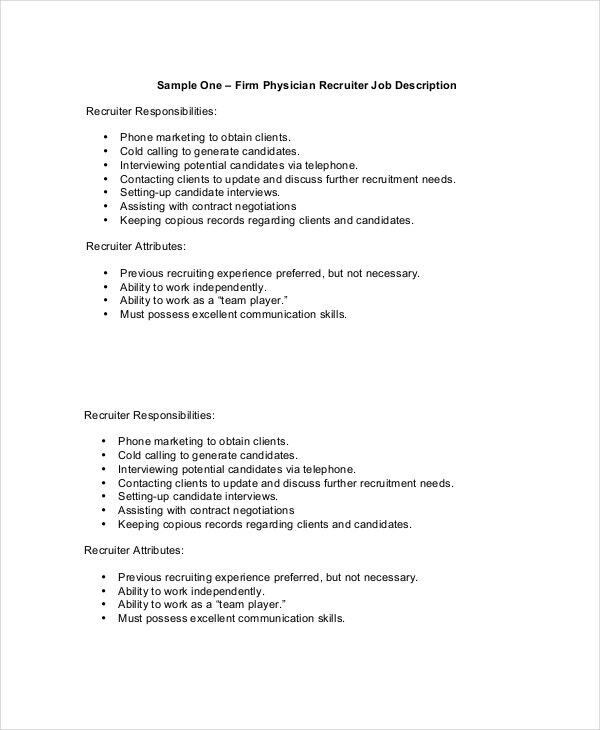 You can also see Physical Therapist Job Description Templates. 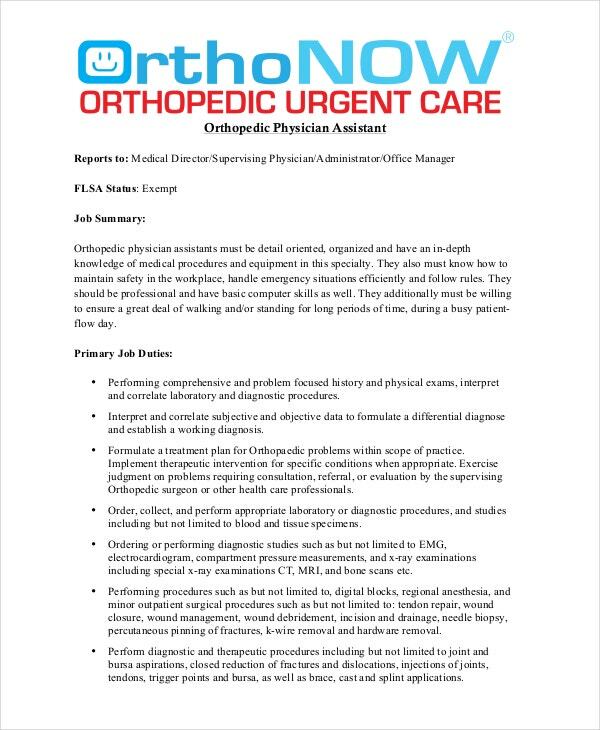 You should always start the description with a job summary so that the physician can have an overview of the job position right from the start. Don’t forget to mention the years of experience required if you are looking for a seasoned physician. Besides, if there are any physical requirements specially required for the job- like a strong eyesight- it should be noted as well. 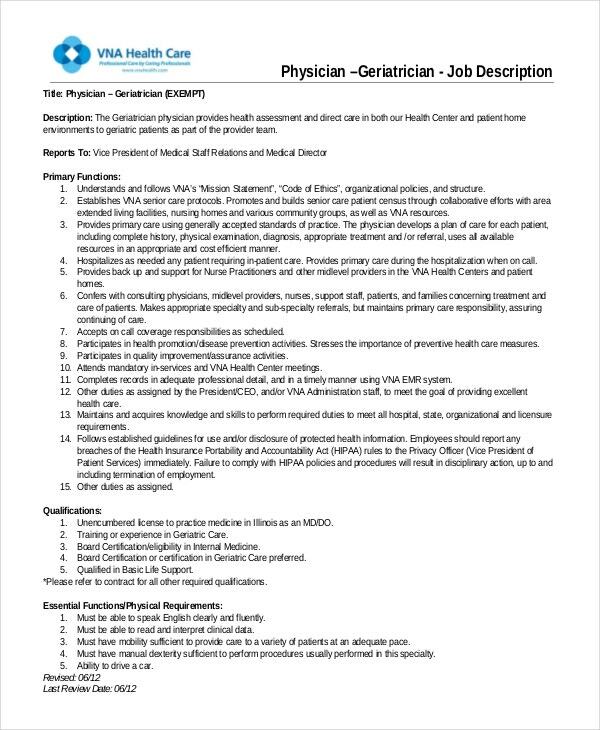 If you are in need of tips on how to write a staff physician job description, this template here would be handy with its standard layout. It starts with a summary and then shows what essential duties and qualifications you have to mention. 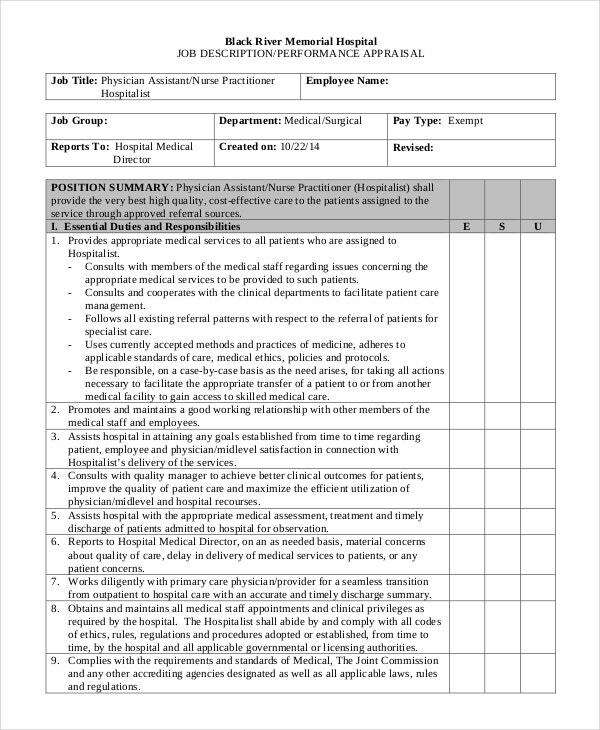 You can also see Physical Therapist Job Description Templates. 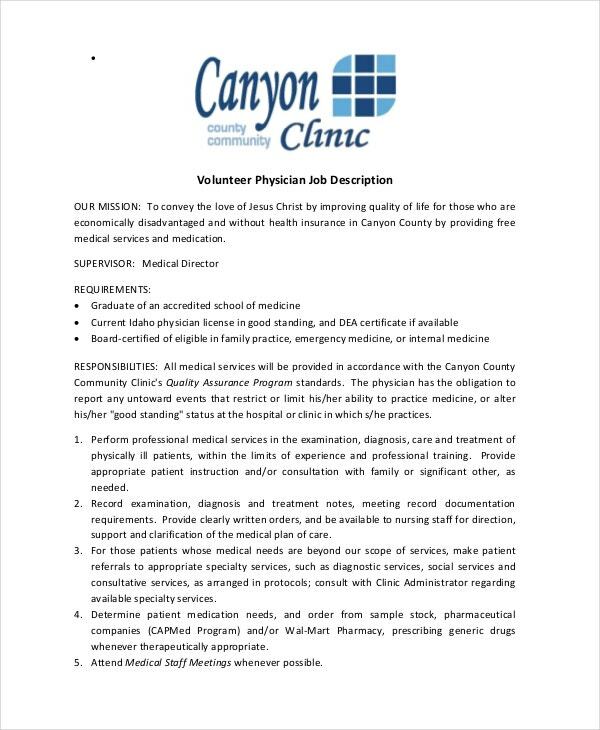 You have a compact physician job description here which begins with a brief on the mission of the hospital followed by requirements and responsibilities. It has done a good job by noting down everything in legible numbered format. 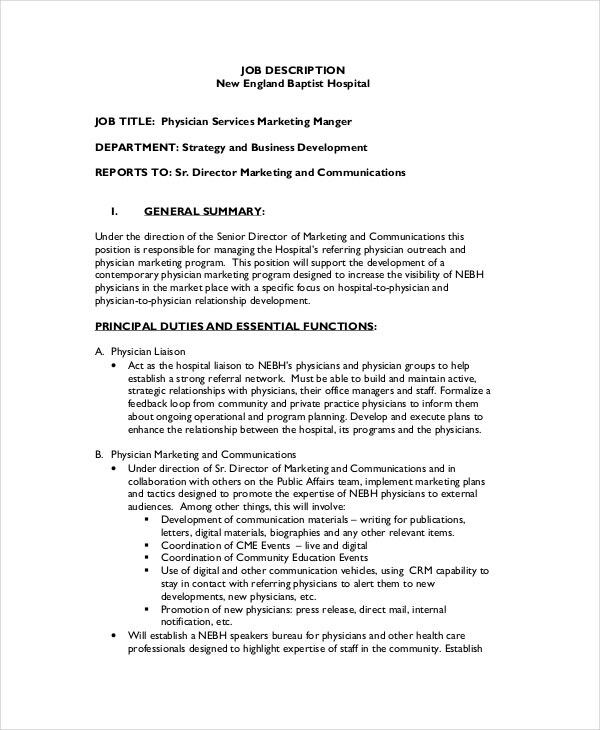 > What is the importance of Writing a Physician Job Description? 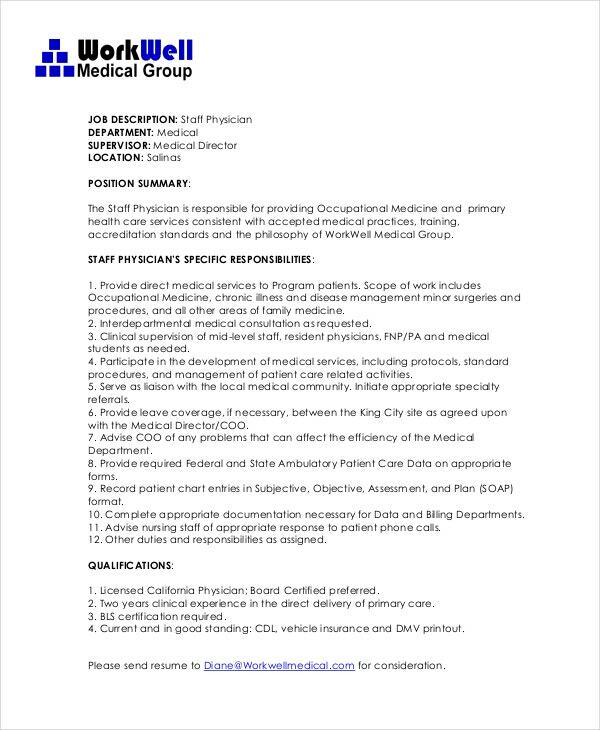 When it comes to hiring physicians in your hospital, you are sure to post a job advertisement- and along with it, don’t forget to attach a physician job description. The main benefit of such a description is that it enables you to detail about the specific qualification and skills required from the desired candidate -so that the aspiring candidates can have a clear hang on what is required for them to be eligible for the position in your hospital. It, in turn, will eliminate the risk of receiving an irrelevant heap of physician resumes on your table. The description will streamline the entire process, making the hiring affair smoother for you. 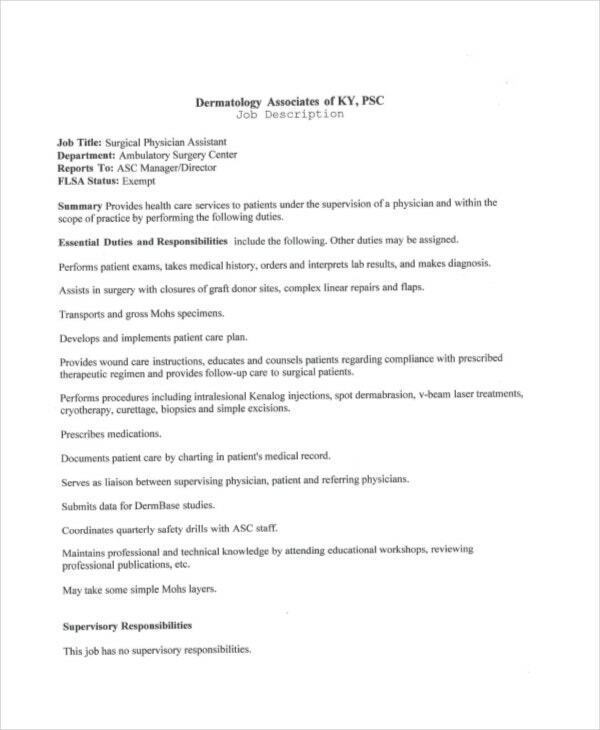 You can also see Pharmacist Job Description Templates. 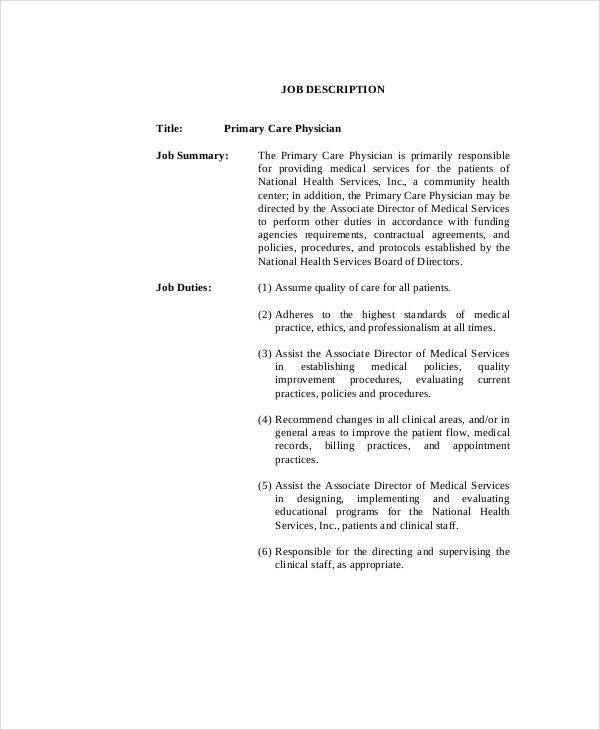 Do you need help in drafting physician job description? Well, you can bank on the physician job description templates mentioned above as all of them will offer you a readymade structure of such descriptions. You would just need to download a suitable one and modify it according to your specific details.